Burlingame Grade School photo from 1908. The site, which was also a courthouse, is now home to the Schuyler Museum. BURLINGAME—The Kansas Historical Society recently announced the Historic Sites Board of Review voted to list the Schuyler Grade School in Burlingame on the Register of Historic Kansas Places. The board also forwarded nomination of the Schuyler Grade School to the National Register of Historic Places in Washington, D.C.
Information regarding the Schuyler Grade School and several other properties across the state was also submitted to the Historic Sites Board of Review for addition to the Historic Public Schools of Kansas list. 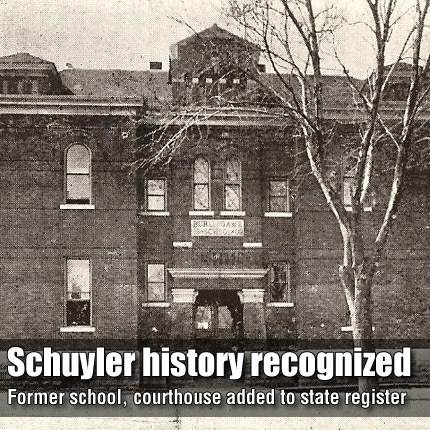 The local significance of Schuyler for education and architecture strengthened consideration for adding it to the list. • Jan. 20, 1897 – “The building was erected as a court house over 30 years ago. The ceiling and wall in the northwest corner of the second story had separated, leaving a gap of approximately four inches.” The building was occupied by 134 students. • The April 4 account also said the cost on the new building will be about $6,100. • George and Arthur Ramskill provided approximately 100,000 bricks from the brick factory. Bricklaying was supervised by M. Pratt, of Lyndon. • The cornerstone was laid July 8, 1902. • Construction of the building was not complete before the first day of school in 1902. Interim classroom sites were established at Oliver’s Store and the U.B. Church. • A community meeting was held on Oct. 31, 1902. The meeting produced a decision to call a school district bond election to secure $2,500 to complete construction, install a heating system and acquire furnishings. • The bond election was cancelled due to incorrect wording in the petition. “The law provided that the call (petition for the election) must read for ‘building’ a school house, while the petition read ‘completing.’” A revised petition was circulated. • The bond election was conducted on Dec. 23, 1902. Despite a 423-3 vote, the election was not sufficient to allow bonds to be issued. State law required a majority of voters to vote for passage of a bond issue. The school district had 985 registered voters. A second bond election was held on Jan. 5, 1903. A total of 570 votes were cast, 563-7. • The first classes were held in the “new two-story Romanesque-style brick school building” on Jan. 18, 1903, when three classrooms were occupied. The nomination also summarizes alterations to the building and adjacent grounds. Beginning in 1955, the Schuyler Building was remodeled extensively. A “modern-style wing” was added to the west side of the building. The main recessed entrance was enclosed. Stairs to the basement were relocated. Original wooden double-hung windows were replaced with aluminum windows. Solid wooden entrance doors in metal frames were installed in classroom doorways to the halls; suspended ceilings were installed above the second floor landing and hall and in first and second floor classrooms. Floors were covered with carpet. Two detached buildings were placed on the grounds in the 1970s. The property functioned as a school until 2001, after which Burlingame Historical Preservation Society, Inc., acquired the property in October of that year, naming it Schuyler Museum. The society had organized seven months earlier. The Register of Historic Kansas Places is Kansas’ official list of historically significant property. Property that is included in the National Register is automatically listed in the state register. However, not all property listed in the state register may be eligible to be included in the National Register. The same general criteria used to assess the eligibility of property for inclusion in the National Register are also used for the state register, but more flexibility is allowed in state interpretation of criteria for eligibility.